Side Ocean View King Studio at The Boardwalk Resort 440! 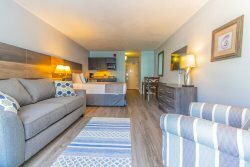 This ocean view studio is located at the Boardwalk Resort. This unit will accommodate 2 people. Unit is furnished with a King size bed, 1 full bath, and a kitchenette (microwave and mini fridge). It has a private ocean view balcony as seen in the pics! This unit is accessed by a main entry door to two units (lock code required to enter). Once entered, you will enter through the right door, which also contains an electronic lock. If you are interested, you can book this unit and the joining unit (to the left) as one. You may open up the separating door and use just the main entry door. If interested, please select the listing titled "Boardwalk 439 & 440". Booking jointly will allow you to sleep 10 and also have 2 Bedrooms 3 Bathrooms full kitchen and living room. Please note that booking this listing will only give you access to the one unit which sleeps 2 as described above.